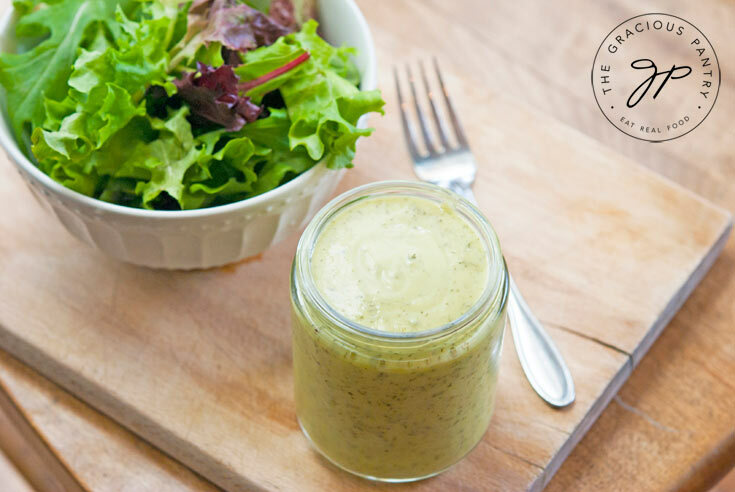 This Avocado Lime Ranch Dressing is the perfect, dairy free alternative to ranch dressing! The truth is, I love salad dressing. I can’t imagine life (or my salads) without it. 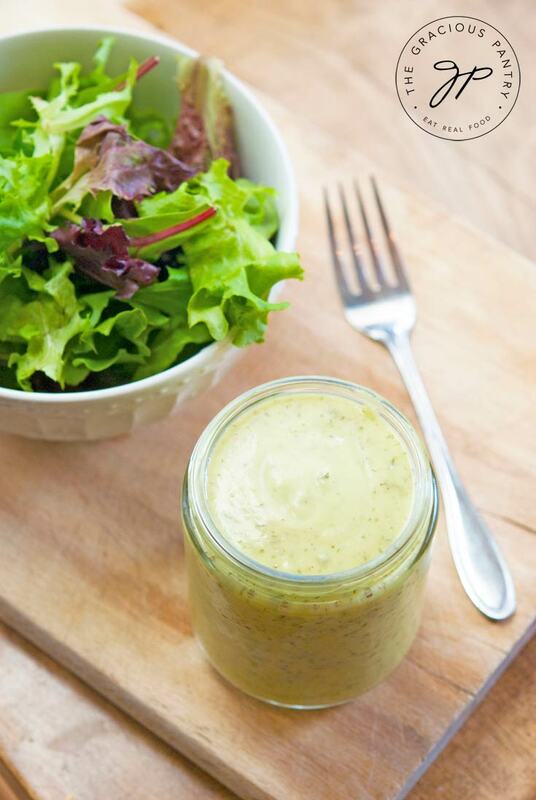 But better still is when a good dressing can double up as a dip or even sauce for pasta! A while back, I made a Clean Eating Avocado Pesto Alfredo Sauce, and it was hit in the McCauley household. So I started thinking about different things I could do with avocados simply because they provide such a smooth, silky texture. Since giving up dairy, Ranch Dressing is the dressing I miss most. 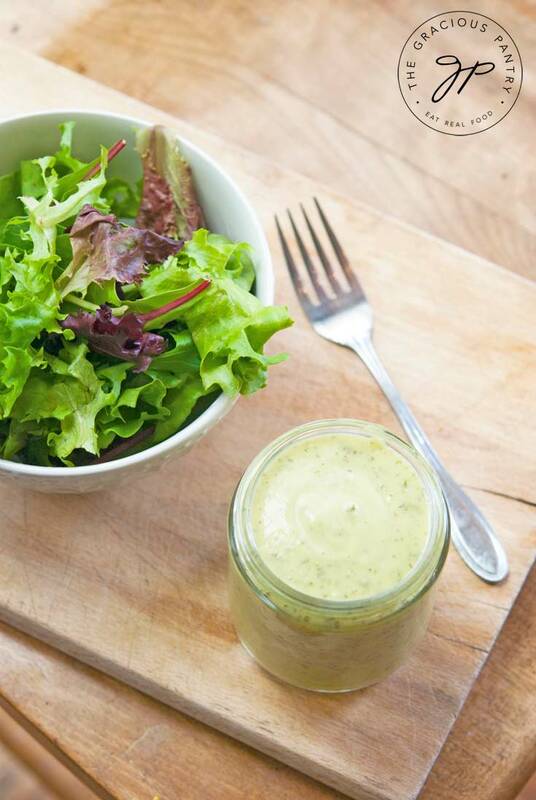 So I got creative with my avocados and came up with this dairy free ranch dressing! Yield will vary depending on how much water you use. Note that serving size listed below is for 2 tablespoons and is based on a 2 cup yield for this recipe. Place avocados, lime juice and spices in a blender and blend until smooth, adding water as needed until you reach your desired consistency. This recipe from the Gracious Pantry archives, originally published 7/18/15. I am so in love with this recipe. Thanks for sharing !!! Hi Tiffany – fantastic dressing. I can totally see serving this with a grilled chicken salad. Pinned for the weekend! Tiffany! I’ve never left a comment before, but I had to! Thank you, thank you, thank you!! I’m learning to be raw and you even covered me!!! This looks delish!! You have my pin! Barb – Why thank you! 😀 I hope you enjoy it! I find the taste of dried chives overpowering and not very pleasant. Could you use fresh chives in this recipe instead? I cannot wait to try this recipe, it looks fantastic!!! Do you think this could be frozen if not all of it gets used? This looks so delish!! How long will it last? A few weeks? Thanks, can’t wait to try it! Amy – My guess would be about 2 weeks, give or take. Hello, this looks absolutely delish! Dumb question… how long does it last in the fridge once made? 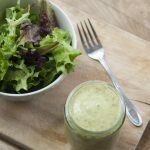 I plan to make this dressing as soon as my avocados are ripe! Kelly – I would guess about a week or so. We went though it pretty fast here, but let your nose be your guide. This was fabulous! We added a little Slap Ya Mama to add a kick to it. Love this! Any chance you can cut back the lime juice or substitute something else? Supposed to avoid citrus due to acid reflux. Jess – You could try using just a little water for consistency. But it would change the flavor a bit. Maybe some fresh lime or lemon flavored basil? Renee – The recipe calls for lime juice, but I never considered the basil. Yum! I love this! But skipping the lime will cause the avacado to brown and go off faster. You need some acid… Lime, lemon, or even a splash of orange juice to keep the avacado from browning too quickly. Supper yummy, couldnt keep the veggies out of it! Lydia – You have a point! I Googled this dressing after reading the contents contained in the Chick-fil-A dressing. I clicked on the link below yours, which was “The Frugal Famer..” and I do not like mayonnaise nor milk, which is what her recipe contains. I was however interested in that it read, gluten free. I don’t see how your recipe could contain gluten, but this would be my question. Admittedly, the extent of my cooking involves a microwave and I cook healthy (I try) frozen pizza and add feta cheese, Greek olives and red onion to make it a Greek pizza. I have been reading about gluten and the brain and would like to perhaps try a gluten free diet. It’s rather laughable, but it seems quite important. I have no earthly idea what products gluten is in, except I heard a clip on television that said it’s in everything. Guess I’ll start Googling as I would not know where to begin. Tracey – Gluten is a part of wheat. Any time you buy bread, cereal, baked sweets… you’re getting gluten. This recipe does not have gluten. Hope that helps! Oh, and cut the avocado to the seed, all the way around. Twist the two halves to separate them from the seed and then scoop out the flesh. It was delicious, definitely making that again someday soon! Thanks! Could you somehow use buttermilk in this for a creamier texture? Kari – This is pretty creamy already, but I suppose you could add a small amount. You just don’t want to make it too tart. I use this recipe at least once a week. I use lemon juice instead, just because it is what I have on hand.Some days I make it thicker to use as a dip for veggies. My kids have grown to love it now that we are dairy, msg and gluten free! Thank you for your recipe! Can’t wait to try this! Looks amazing!! ???????????? Dianne – Thanks! Hope you enjoy it!